I am quiet a starter on Rpi2 and first try out with Raspbian. 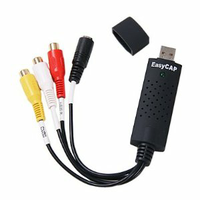 Downloading and installing the official releases following instructions from easycap-somagic-linux https://code.google.com/p/easycap-somagic-linux/ and I have been able to grab with somagic-capture. Now I really do not know how to process that on IoT! I suppose then that this driver need to be compiled for ARM platform? The device's drivers are not installed. You might like to try "Generic USB communication" viewtopic.php?t=117061&p=847157 to get the very basic communication going but beyond that you are on your own (as this is not on the supported products list at MS). You could try asking Somagic what plans they have to support their devices under Windows IoT on the Pi. I'm getting this exact error but I'm connecting and Arduino Nano. Thanks for the generic usb device, I tried out the solution but I still get same error. I replace VID/PID as following: VID_1C88&PID_003C that I extracted from SmiUsbGrabber3C.inf file. Windows 10 IoT Core has changed over the last 2 years, may I suggest you run the latest Insider Preview release.